nt sources, the Hmong constitute the third largest ethnic group in the Lao’s People Democratic Republic (LPDR). According to the 2009 national census, the majority of the Hmong population in Laos is situated in the mountainous northern area of Laos. As for the Hmong ChaoFa – namely those who are not Buddhist nor Christian but who believe in the Mother of Writing, Shonglue, who revealed the written scripts and Shonglueism to the Hmong in 1959 –, the provinces they inhabit include: Houaphanh, Xieng Khouang, Sayaboury and the city of Luang Prebang along the Mekong River. Some mountain peaks such as Phou Bia reach above 2,800 metres in the region. Dense forests also cover the Northern and Eastern areas. This Hmong territory borders Viet Nam in the East, China in the North, Myanmar in the Northwest and Thailand in the West. Under the 1991 Constitution, the Lao People’s Revolutionary Party was designated as the one and only legal political party in the country. Accordingly, the rule of law is undermined by political interference and endemic corruption. Moreover, widespread restrictions exist with the freedoms of expression and association, causing the imprisonment of political opponents, arbitrary arrests, enforced disappearances, abject poverty, inequalities and a lack of access to health and education for part of the population. These restrictions are further accompanied by severe limits on cultural and religious freedoms, especially for ethnic minorities and indigenous peoples such as the Hmong. The Congress of World Hmong People (CWHP) has been a Member of UNPO since 2007. It represents the ChaoFa Federated State internationally. Given the aforementioned violations of the rights of the Hmong, UNPO strongly condemns the military violence against the ChoaFa indigenous civilians in the Special Zone of Xaisomboun as well as the intimidation, harassment and persecution of human rights defenders, journalists, and members of minority communities through arbitrary arrests and enforced disappearances. Moreover, UNPO believes that developing a legal framework is necessary to protect local inhabitants from land grabbing and forced relocation, as these practices significantly affect the economic activities of Hmong people, depriving them from their own means of subsistence. UNPO also supports the Hmongs’ demand for independent international mediation to allow a fair dialogue between the Lao government and the people. 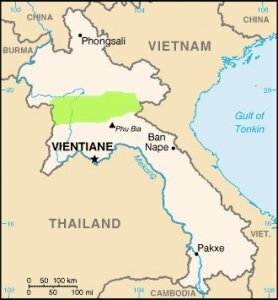 For the Hmong still living in Laos, and more specifically for those who have fled to the Laotian jungle, the consequences of backing the losing side in the Viet Nam War are still apparent, as persecution is a daily reality and many Hmong live in fear of arbitrary arrest and torture while experiencing abject poverty. In addition, areas of the Hmong territory and villages are facing environmental problems related to gold mining, illegal wood logging and dam building. These activities have reached record numbers, based on a rhetoric of economic independence and rural development to sustain the country’s poverty reduction propaganda. These developments continue to cause environmental hazards and erosion, the reduction of wildlife and fisheries, the disappearance of the historical wilderness and above all, the destruction of nature. Ironically, the Hmong are often accused of causing the country’s deforestation problem and thus forced to relocate. Seeking refuge in other countries has become dangerous for the Hmong. Viet Nam and Thailand have standing collaboration efforts with the Laotian government to detain and cooperate in the forceful repatriation of Hmong refugees to LPDR. Such collaborations have also extended to military campaigns within Laos’ borders, violently targeting the Hmong communities hiding in the jungle. Because the government of Laos does not recognize the Hmong as an indigenous people and has no specific legislation in this regard, they are not eligible to a series of benefits they would otherwise attain. Explicit indigenous recognition would provide additional mechanisms to address uncompensated land confiscation, natural resource exploitation and abuses of their cultural and religious rights. Please download our Hmong Member profile brochure or the Hmong Briefing Note to learn more.